The Organic Tippler: Aged Preservative Free Wine! Freehand Natural Wines 2003 Cabernet. Aged Preservative Free Wine! Freehand Natural Wines 2003 Cabernet. Since the dawn of winemaking time there have been arguments about just how long a bottle of wine will last if we don't use preservatives of some kind (usually sulphur dioxide 220 or potassium metabisulphite 224. If you want to know more about preservatives in wine read this article). 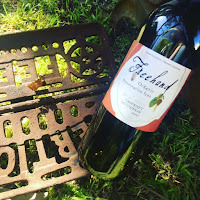 Many of the preservative free wine producers opt for the conservative approach making the wines in a "drink now" style, they advise a maximum cellaring of 1-2 years, and only produce smaller quantities that will sell out before the next vintage. Matt Eastwell and his pals at Freehand Natural Wines have decided to push the envelope on this one, and all I can say is THANK GOODNESS THEY DID! We now have in our stock an incredible Aged Preservative Free Cabernet, 2003 Vintage. 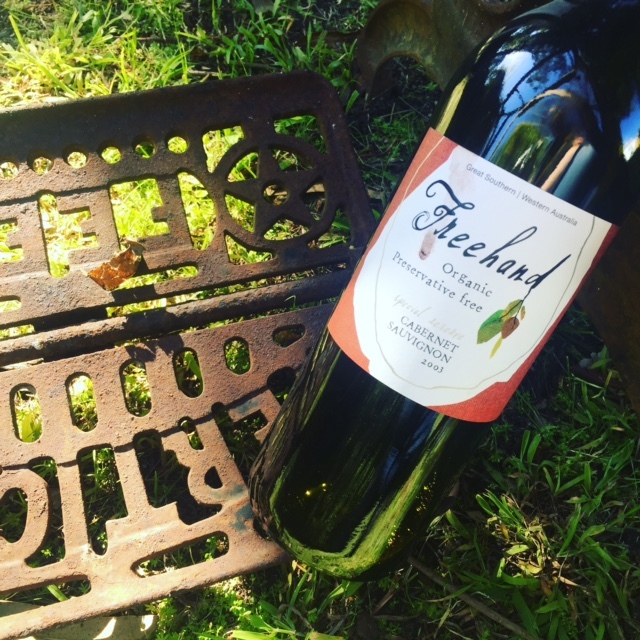 Before I rave on about the wine, let me rave on about Freehand… A relatively new winery in the Great Southern Wine Region of WA, Freehand is what it says it is. A non-certified, organic and biodynamic vineyard. Wines are produced by Matt and his highly committed team. They are passionate about the environment and making sure that this vineyard and the earth in general are in better nick when it comes time for them to leave it. These lovely people are to be admired for their philosophies and the way they grow grapes and produce wine. Don't let the lack of certification put you off! Now to the wine, sigh… The 2003 Cabernet is a deliciously mellow drop. Made gently by hand with small, intensely flavoured berries it has a gorgeous cherry red colour, with orange highlights around the rim. First sniff leaves you with lovely aged characters of leather beeswax and tobacco leaf, and just a little earthiness. Basically it makes you want to just dive right on it. But don’t rush it, this wine has been waiting 12 years to be tasted, so please spend some time savouring each of the elements. The mouth feel is oh so velvety and silky smooth. It’s a bit dangerous really, as it’s very easy to find yourself at the bottom of the bottle without too much effort. The flavour profile is cedary with a savoury edge, and just a hint of blackberry fruit, although as the wine breathes it seems to change and evolve with each mouthful. I'm sure, if we'd managed to leave some in the bottle for the night, it would have had a totally new flavour profile in the morning. This wine has aged exceptionally well, and could easily get away with claiming to be a few years younger. It is delicious and a bargain for $30 or under. Buy it here!